Character dining is a great addition to your Disneyland vacation. If characters are your main goal, today I am going to share with you my favorite character dining option at Disneyland – Plaza Inn Breakfast with Minnie and Friends. 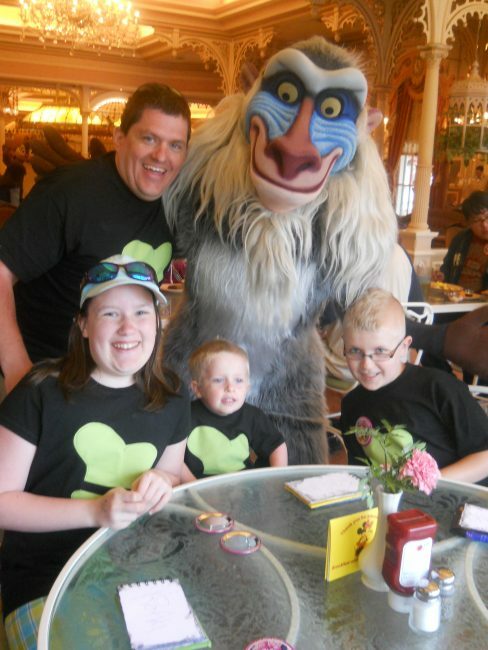 Keep reading to find out why this is my absolute favorite character dining at Disneyland Resort. If you have read my blog for some time, you probably know that I am cheap thrifty when it comes to our Disneyland vacations. Because of this, it took us a long time to do a character meal at the parks. But once we did them, I was hooked. Is The Plaza Inn Character Dining Worth The Cost? First, before we get into my favorite character meal, I want to talk a little about if the character dining options are worth the cost. This, like so many other decisions with your Disneyland vacation, has to be a personal decision. As someone who has always been budget minded, I never could figure out why people would want to spend money on a character dining meal when you can see the characters for free in the parks. 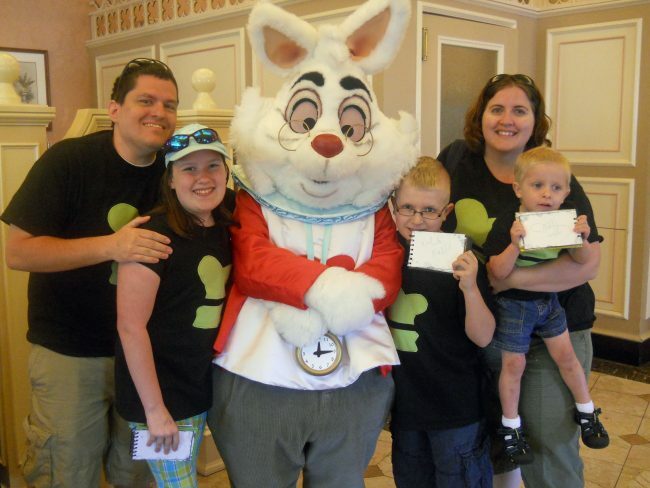 We decided to do a character dining option for the first time in March/April of 2013 when we took our niece and nephew to Disneyland and happened to be there on Easter. We booked Disneyland’s Plaza Inn Breakfast with Minnie and Friends as a special Easter treat. After that visit, we were hooked. We have done a character dining almost every single trip since then. So here is why I think character dining at Disneyland is worth the cost. You can eat a TON! The character dining meals at Disneyland are buffet style. This means you can eat a ton (and probably skip lunch if you go for breakfast). I also love that if my kids decide they don’t like something, no problem, they can go get something else. It will save you time. Yeah, character dining takes about 60-90 minutes out of your day, but we found doing the character meals can actually save us time because we get a chance to meet so many of the characters without having to wait in the long lines in the park.I will talk about this a bit more in a moment, but we found that we were able to save probably what would have been a few hours of line time to meet characters later in the park. Rarely seen characters. One thing that is a huge draw for character dining meals is the fact that you can see characters you will rarely find in the park. While some of the meals only have members of the Fab 5, a few have rarely seen characters. So now that I shared why we feel character dining is worth it, I want to share with you more details about my favorite character dining option- Disneyland’s Plaza Inn Breakfast with Minnie and Friends. I love eating at the Plaza Inn for a few reasons. First, I love that if I book in the earlier morning, there is a separate entrance to Disneyland park for those with reservations. Now, it used to be that you could make a reservation to eat before the park opened, and I loved doing that so we could go in and get a few quick pictures in front of the castle with nobody else in them, but sadly, this is no longer an option. You can however book during a magic morning and go in through the special entrance and not use your magic morning. This means you can get most of the meal out of the way before official park opening. I also love the food at the Plaza Inn character dining. They have a great variety from pancakes and bacon, to fruit parfaits, and more. That fact that it is all you can eat is great too because we are usually full enough to skip lunch and just have a light snack. 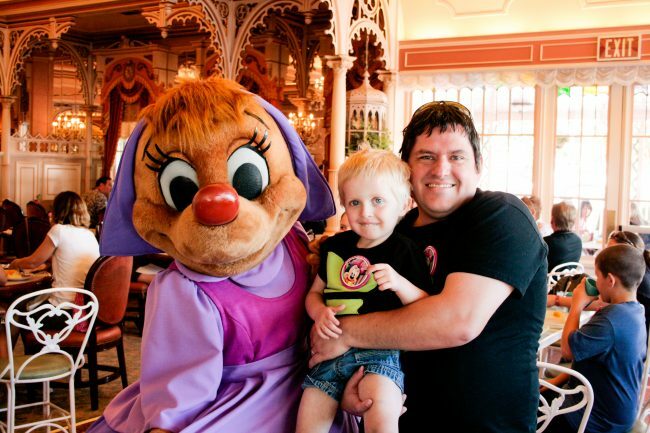 We have never had a bad meal at the Plaza Inn (any time of day) and breakfast was no different. I absolutely love the characters. I have broken down all of the Disneyland character dining option Disneyland character dining options but I have to say that I have found that Disneyland’s Plaza Inn Breakfast has the most characters and the best variety. Regulars include Minnie, Chip, Dale, Pooh, Eeyore, and Tigger. Some of the more rare characters include Max (Goofy’s son), Hook, Fairy Godmother and some of the mice from Cinderella, the White Rabbit, and even Rafiki. 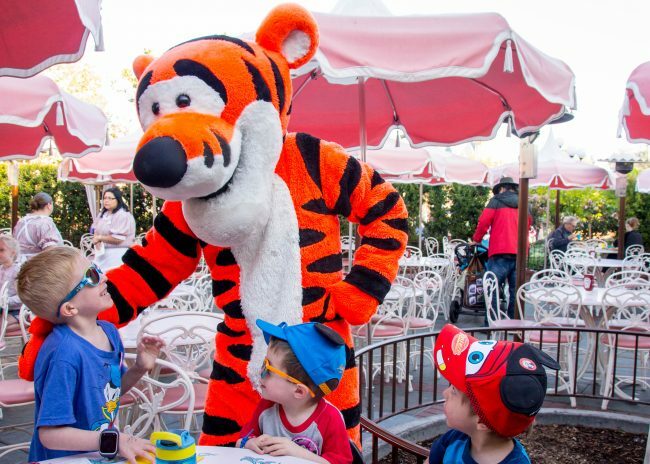 After meeting so many characters at breakfast, you will be able to focus on rides and other attractions the rest of the day. I have said many times that I have felt a bit disappointed at other character dining options because they have nowhere near the same amount of characters as the Plaza Inn breakfast. 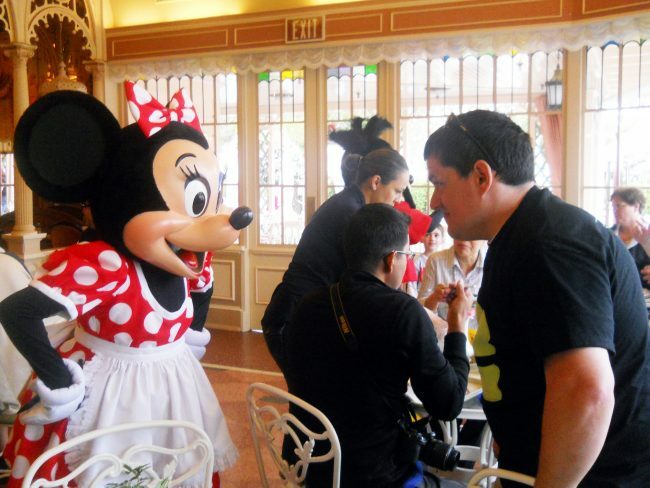 I have always seen at least 10 characters at the Plaza Inn Breakfast with Minnie and Friends. 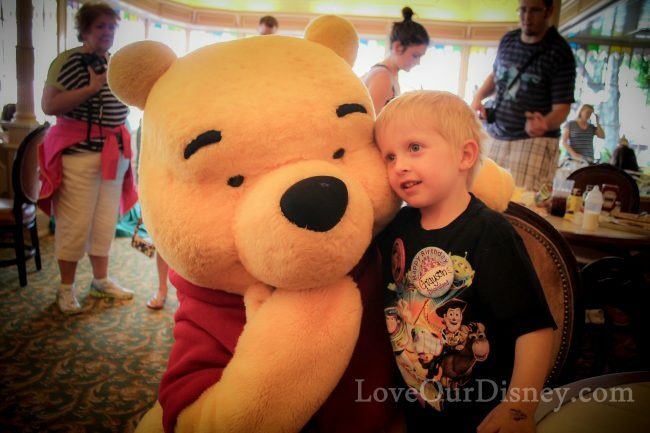 The best part about the character dining meals is not only the characters but the interaction that you get. We have had staring contests with Minnie (Minnie won) and been photo bombed by Tigger. We have Hook teach us how to be a pirate and the Fairy Godmother talk to us about what it is like to grant wishes. We have had so much time to interact with the characters and while we do get to interact with them in the parks, this is a whole new level. 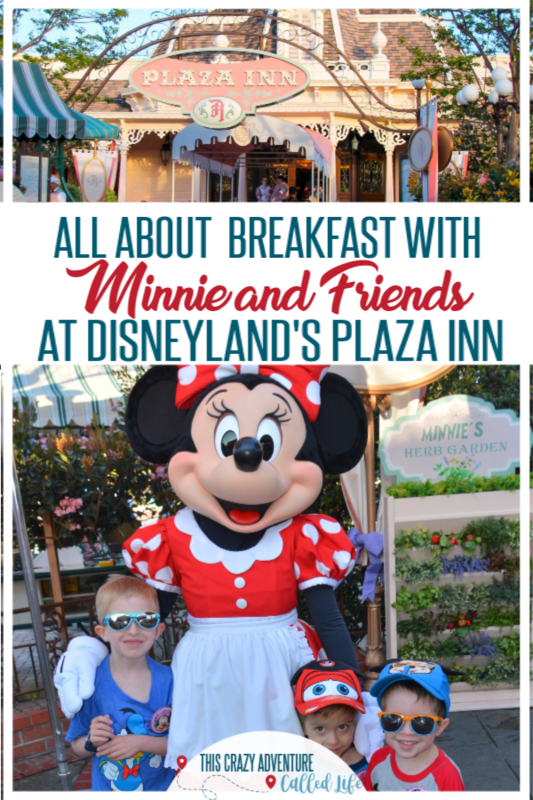 So you may want to know some information about the Plaza Inn breakfast with Minnie and Friends before deciding if this is worth it to you. Cost- There are two levels of character meals at Disneyland. Regular and premium. The Plaza Inn breakfast is classified as a regular character meal (though I found it more delightful than the premium ones). The cost of the Plaza Inn character dining is $36 per adult (10+) and $19 per child (3-9) as of March 2018, but you will need to add tax and gratuity. Children 2 and under are free, but be sure you include them in your party count when making your reservation so they have somewhere to sit. Reservations- I highly recommend making reservations as early as possible to get your preferred time frame, but as with most Disneyland dining experiences, you could probably get a reservation as late as a week or two before. Disneyland Resort opens reservations 60 days in advance. To make dining reservations you can use the Disneyland app, go online or call 714-781-DINE (3463). Photos- If you have purchased MaxPass your picture with Minnie as you enter the restaurant will be included or you can purchase this photo separately at the breakfast. MaxPass may be required to show their confirmation email. There are no photographers walking around with the characters though so you will need to bring your own camera to get pictures with your favorite characters. If you can get outdoor seating, the lighting makes it much easier to capture great photos with your favorite characters. Autographs- Bring your autograph books. The characters will be happy to sign them. This is a great way to fill up some of those pages in a short amount of time. Time- Character dining does take a good amount of time (but like I mentioned before, you kind of make that up by not having to wait in character lines). Plan on a good 60-90 minutes for your meal. You may take less time, but this way you don’t have to rush. This breakfast looks like so much fun. I am adding it to our list of must dos on our next trip to Disneyland. You really have me wanting to head back to the West Coast for a Disneyland adventure!! This is going on the list of must-dos if and when we go again. Great post as always Becca! We haven’t had breakfast here yet, but I think I’ll add it to my list of meals for when we are able to take our next trip to Disneyland! I have to say, I enjoy Disneyland’s Plaza Inn Breakfast more than the Crystal Palace version. Perhaps it is because you can gaze at Sleeping Beauty Castle while soaking up that California sun! The food is always delicious, the characters beyond the norm (my son LOVES Max), and it never seems quick as manic as its Orlando cousin. I’m with you Becca- this one’s premium in my book! We had so much fun eating here! I love that Minnie has such a random assortment of friends 😉 A lot of the ones you saw were different than who was there when I went so that’s very cool too! Loved the one Plaza Inn breakfast we did. Actually liked it even more than Crystal Palace! great post. Great info! We’ve never done a Disneyland Character Breakfast before, but those characters! 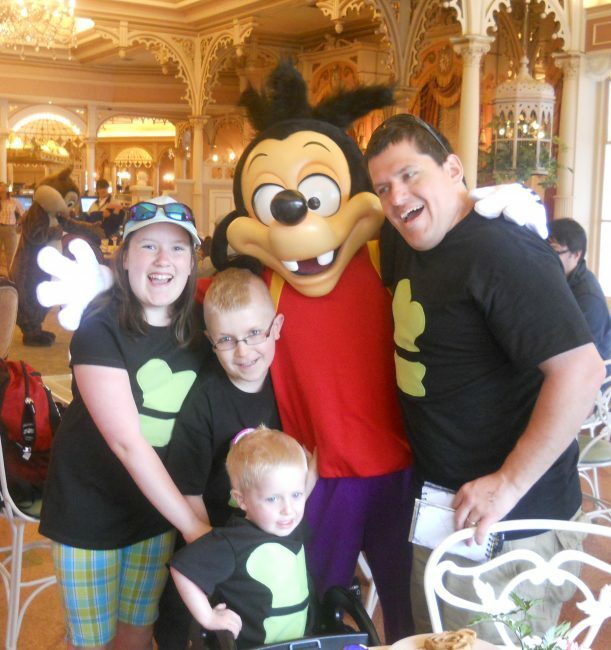 We have four autistic grandchildren and feel that taking them to a character meal or two might be the perfect setting for them to interact with some of their favorite Disney characters. Your explanation of why you think they are worth the money was particularly interesting and revealing. You provided a great deal of information to peek our curiousity about this particular character breakfast, but we do have two questions. What are the hours? Are there separate seatings? Hi! 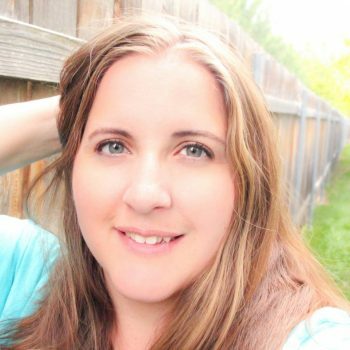 I just found your blog and am so thankful for all the great info! I’m curious to learn more about this part when you said, “You can however book during a magic morning and go in through the special entrance and not use your magic morning. This means you can get most of the meal out of the way before official park opening.” Can you explain how to do that? We have one magic morning included during our trip And I would love to know how to use it to my advantage. Thanks! So don’t book a breakfast during your magic morning but on another day that has Magic Morning, before the general park opening. So if Magic Mornings all week start at 7 am and you use your MM entry on Tuesday, on THursday, try and get a 7 or 7:30 breakfast at Plaza Inn. You can get in, and still be mostly done with your meal (and still make MaxPass choices during your meal) by the time the park opens.